It’s easy to get stuck in your morning routine before realizing that the entire brew system has been building up water spots and free range coffee debris. These can lend off-tastes to the cup of coffee that your strive so much to make perfect. 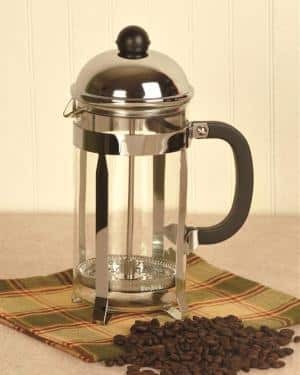 Coffee oils that sit and age on your brewing equipment can infuse your fresh coffee with staleness and bacteria. Nobody wants to deal with this. 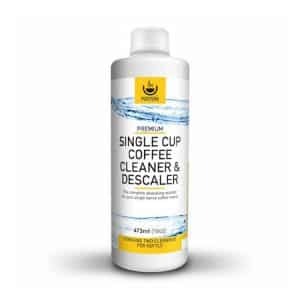 If these brewing issues are plaguing you and an easy solution is what you seek, then take a look below where we’ve featured our own reviews of the best coffee maker cleaners and descalers on the market today. Urnex has a long history of manufacturing a diverse line of coffee-specific cleaning agents. Out of all of their cleaning products, the most well known has become their Cafiza line. These tablets are considered the industry standard when it comes to cleaning espresso machines that undergo plenty of daily use. Unrnex now creates coffee cleaners out of a desire for increased environmental consciousness and sustainability. Using the Urnex cleaner is as easy as draining and rinsing the urn or brewer reservoir. Pour in contents of packet, add a quarter to half full with very hot water. 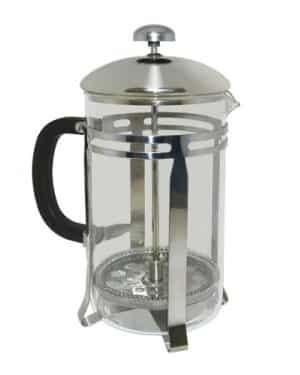 Simply scrub sides of vessel, drain and repeat until noticeable coffee stains are removed. It’s worth mentioning that the Urnex Clearly Coffee cleaning agents are petroleum free and won’t impart strange chemicals into your beverage when cleaning is performed properly. Over 80 years experience won’t lead you astray. 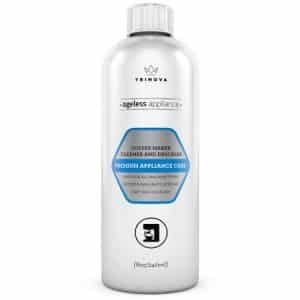 Anyone who has experienced the troubles of cleaning a complex machine like the Keurig will fully appreciate the work that TriNova has put into creating this Keurig machine cleaning solution. 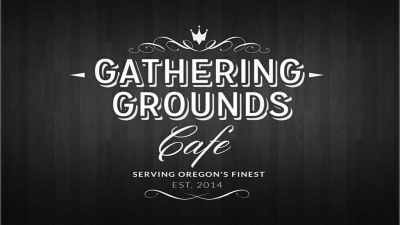 It’s applicable when cleaning other coffee brewers as well but perhaps the testimony of Keurig users freeing their machines from buildup is enough to win you over. The Descaling solution is also tasteless and unlike Vinegar, this citric acid formula won’t impact your morning java, leaving no odor or smell behind. The TriNova brand is responsible for creating a variety of other material cleaners like leather for the interior of your car. They seem to be passionate about cleaning out important machines that people use daily. Test out the TriNova descaling solution and see if the effects of their engineering bestow a cleanliness to your coffee creation. Java Clean is unique in that it provides a color feedback when cleaning. Its natural yellow color dye is added to the formula so you visually know when the brewer descaling process has been fully completed. This means no leftover solution makes it’s way past your watchful eye. Changing from yellow to clear means you are done descaling! 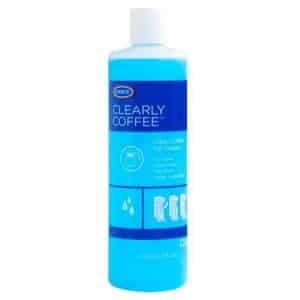 There’s truly no other coffee cleaning product that implements this kind of defense against ingestion of the cleaning solution. Most others you’ll find are clear color formulas giving no true visual indication for when a flush descale process is fully completed. 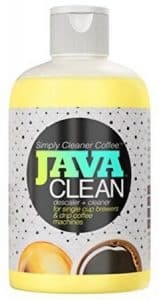 Java Clean Universal Coffee cleaner is truly unique and features a great way to save your coffee from misuse. The K3 Brand has created the Pure Perk descaling solution for coffee machines and kettles and is aimed towards making sure you extend the life of your home brewers. Its an odorless solution which works hard to preserve your brewing equipment and lengthen the time in between cleaning sessions. This is particularly helpful if you’re forgetful in cleaning your brewer (as most of us tend to). K3 Brands Pure Perk cleaning solution uses an organic base to create optimum cleaning conditions that don’t disturb the environment in the process. We know that brewing equipment is on the rise, technologically speaking, so it’s important to treat with solutions that are reliable and won’t impart strange tastes. Don’t leave your expensive brewer to a haphazard solution of vinegar, which in itself is difficult to clean up after. Coffee lovers want that perfect cup, every time. 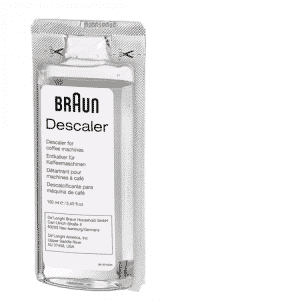 Join the fight against the buildup of minerals with Braun’s BRSC003 descaling solution. You’ll need a good defense first, so try the Braun coffee cleaner to fend off limescale leftover from the many brewing processes. The Braun name might sound familiar if you own one of their many shaving or hair trimming devices, but their expertise for cleaning those difficult machines has lent itself to developing a plethora of cleaning solutions. Use this solution for a variety of brewers and even your Aeropress or French press, where water stains and minerals can build up. Let’s be honest, if a Swiss rescue dog came to save me from an avalanche stocked with a bottle of this, I wouldn’t be too upset. This decalcifier formula was created specifically to protect and treat high-end brands of espresso machines. Again, these kinds of machines deal with fine particles and can easily create mess even under the most scrutinous of barista. 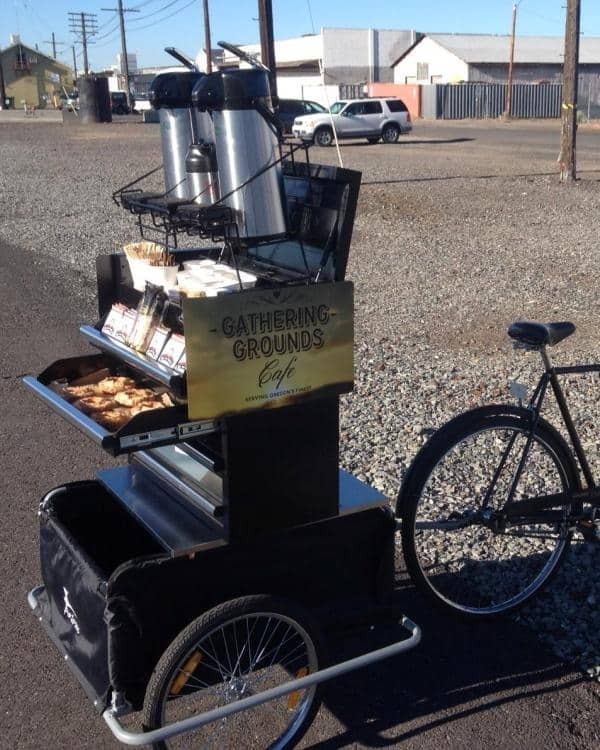 This solution extends the life span of machine and helps deliver an espresso product you can be proud of. 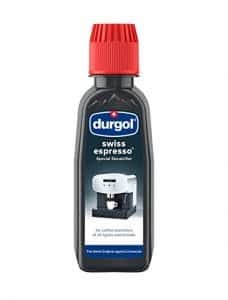 The Durgol Swiss Decalcifier works with fully or semi-automatic machines, manual machines, coffee pod or capsule machines, filter machines, even electric water heaters. Whatever you can throw at it. This is a powerful cleaner which works on the spot. That’s likely ten times faster than other decalcification processes. 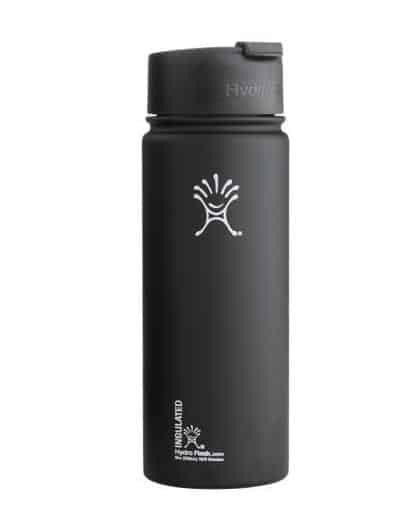 This is also an environmentally safe solution contained within 100% recyclable bottles. 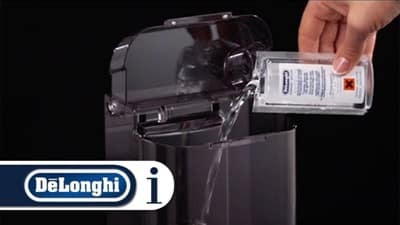 DeLonghi prides themselves on the non-existent ecological impact their products have. This cleaner is no different. It’s made from natural ingredients and without harsh chemicals. Predominantly, this descaling solution is used for treating Nespresso machines, which can be quite complex. 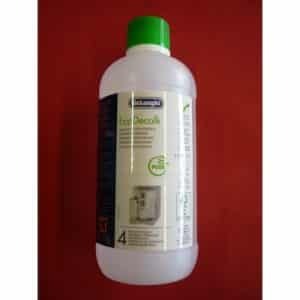 The De’Longhi EcoDecalk machine descaler is a liquid treatment that should be used regularly to significantly reduces the build-up of minerals and off-flavors that water can impart over time. Cleaning your complex brewer increases the energy efficiency, and improves the flavor and crema, allowing those great coffee oils to perform at their best. Comprised of solely lactic acid, this brewer is suitable for all coffee machines. Wether you’ve got a Keurig on the fritz or simply can’t stand looking at the stains troubling your glassware, it’s time to choose one of these products to bring the luster back to your morning coffee routine. There’s plenty of options out there, and if you’re looking for more coffee ware to clean, check out our shop.